BAYHAM: The Aftermath Of The Scalise Shooting And The Shameless "Resistance"
That was the question that domestic terrorist James Hodgkinson, whose social media postings clearly marked him as a member of “The Resistance,” reportedly asked before he let loose a barrage of gunfire on a baseball field where members of the GOP caucus were practicing before their annual game against the Democrats. That was the measure of someone’s humanity in the twisted mind of the committed Leftist/Resistance activist as he tried to pull off a massacre. If you are a Republican, you’re not human and you don’t deserve to live. 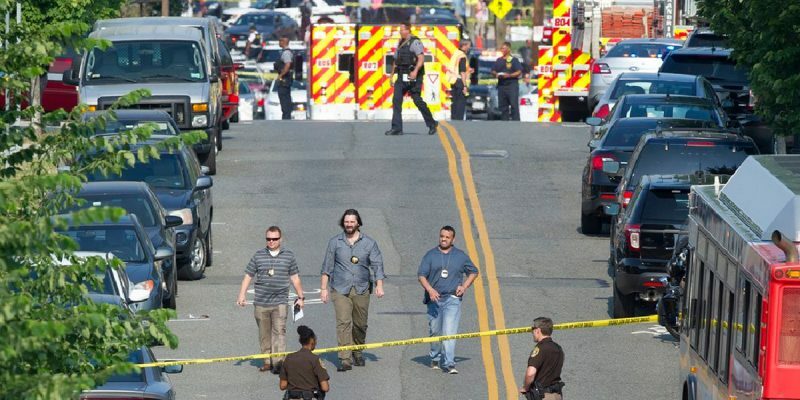 While there’s no question that Hodgkinson was a deeply disturbed individual, he’s had plenty of encouragement along the path he followed to the DC suburb of Del Ray, where he spent several weeks stalking the Republican baseball team with an assassination list in his pocket. Hatred of the Republican Party is not just en vogue and celebrated in the media and entertainment but so is personal isolationism and irresponsible rhetoric designed to incite people to vote Democrat, advocate Democrat, and do things that aren’t so civil – such as cause disruptions, hurl profanities, and other direct action to advance the cause. Statements that the Republicans are going to kill people through their repeal of Obamacare are accepted as not just gospel but justification for mass murder. For Democrats, the shooting wasn’t so much a tragedy but a public-relations nightmare that needed to be managed, even if shamelessly. Tripping over Scalise’s stretcher to score points as he explores a White House bid, Virginia Governor Terry McAuliffe exploited the shooting to decry 93 million Americans die every day from gun violence. Other Democrats have brought up Scalise’s position on gun control to make it appear he was responsible for his own misfortune. In their self-righteous minds, the shooting wasn’t about the attempted murder of a husband and father but something to be spun and put into context. It’s not the charged words and slanders we’ve broadcast across television and social media but the tool used, they’ve countered. And then the New York Times tried to stack false narratives by linking this week’s Virginia shooting to a Sarah Palin campaign piece in 2011. Even Mother Jones cried aloud “Merde!” on that hit job by the Times editorial board, which in turn cried “Uncle!” more out of legal liability than any sense of journalistic integrity. It just took the paper of record six years to make that retraction. A few weeks ago Seattle Times columnist Danny Westneat wrote a piece expressing his shock when Seattle City council member Kshama Sawant smugly announced at a meeting that she had no Republican friends. And it wasn’t just the Socialist Alternative politician’s announcement that stirred Westneat but those in attendance at the meeting cheered her social isolation from those with opposing views. Granted Seattle is one of the most left-wing cities in America and their idea of diversity is people of different colors, genders, and sexual orientations chanting the same screed. Call it ideological segregation if you will and the Democratic Party is just as committed to the new segregation as they were the old. That’s simply not good for a tranquil society, civil discourse, and a healthy democracy. It’s as damaging to societal harmony as adopting a quasi-military and wholly radical term like “The Resistance” as a name for a movement which refuses to accept the results of an election. Case in point. Louisiana Democrats who served with Scalise in the state legislature have bluntly condemned not only this shooting, but previous character assassination attempts by local leftists that are being recycled again to justify the armed attack. Chairman of the Congressional Black Caucus Cedric Richmond in particular has stood by Scalise during the previous character assassination attempt and the current actual assassination attempt. The difference? Familiarity. And I should add sanity. It’s much easier on the conscience to hate and villify strangers. A person’s worth should not be determined by their party affiliation and neither should their right to exist. Hodgkinson’s mentality – and in fact that of much of The Resistance – was no different than that of ISIS; the Berniac simply swapped religion with party. The Democrats have sown the seeds of this bitter harvest, a harvest that will be hauled not by tractors but hearses. How many cops are dead today because Democrats encouraged protests and smearing of law enforcement, based in part off exaggerations and outright lies? All done to get their base activated and motivated. It’s time for the Democrats and their confederates in the leftist academic/media/entertainment complex to stop planting any more seeds of hate to achieve political ends. Hodgkinson doesn’t need to become the first of many trying to fundamentally transform America by the bullet.